I’ve always had a fascination with cities – their energy, creativity, community, and diversity. Walking and biking present opportunities to truly experience our physical environment and understand how it impacts us each and every day. As Jane Jacobs said, “cities have the capability of providing something for everybody, only because, and only when, they are created by everybody.” I am so fortunate to work in a field that focuses on creating communities for everyone by involving everyone – leading to the creation of places and mobility choices that truly connect us with the communities where we live. 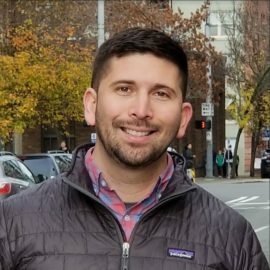 Brandon is an experienced urban planner and project manager who specializes in relationship building, public engagement, planning and transportation policy, effective communication, and community building. He has over 10 years of experience leading long-range transportation planning, comprehensive planning, infrastructure planning, small area planning, and growth management projects. Brandon is a natural leader who takes pride in his ability to work with diverse stakeholders to reach consensus and offers deep experience facilitating advisory groups and elected bodies, reviewing and implementing city code, and developing mobility solutions that consider the land use and urban planning framework. He has worked in both the public and private sectors and understands the challenges and opportunities associated with active transportation planning in cities. Alta creates active communities where bicycling and walking are safe, healthy, fun, and normal daily activities. Join the thousands of subscribers to our newsletter for the latest news and trends of the active transportation industry.